After skipping October, Google updated the Android distribution numbers today for November. The latest data collection shows Marshmallow on almost a quarter of all Android devices, plus Nougat debuts in the chart. As for specifics, Nougat is on exactly 0.3% of Android phones, while Marshmallow is up to 24% (from 18.7%). 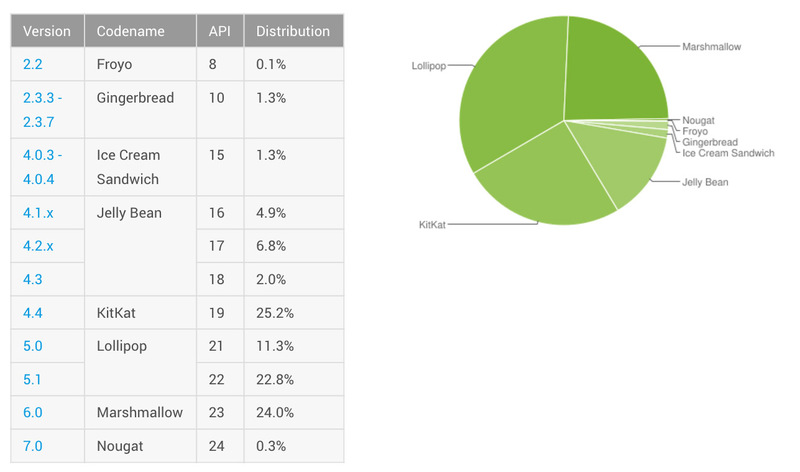 Lollipop dropped to 34.1% (from 35.0%), as did KitKat (27.7% to 25.2%), Jelly Bean (15.6% to 13.7%), Ice Cream Sandwich (1.4% to 1.3%), and Gingerbread (1.5% to 1.3%). Froyo somehow remains on the list with 0.1% of the pie. September’s numbers can be viewed here.